After five years of working her tail off to buy Manny the Cuban’s diner, Scotti is hurtling down the home stretch to seal the deal. But her investor's sudden death stops everything in its tracks—and the money she was counting on is gone. Scotti Fitzgerald and her long time friend Zelda. love and of cause a suspected murder. 5.0 out of 5 starsMystery, murder and a fun story. I enjoyed this quirky mystery written with a touch of humor. Because of the author's flowing writing style the over four hundred page book feels much shorter. Scotti Fitzgerald is a lady I'd like to meet. Right now, she is a waitress and chef at a restaurant. She would love to own the place, and thinks she might have a backer. the the worst happens, that man is found dead. A mysterious letter found in a briefcase sends Scotti on an adventure to uncover a mysterious death and a likely murder. The story is fun with some great twists and readers are going to love this story. 5.0 out of 5 starsCoffee & Crime - A big hit! I loved this book! As a huge mystery fan since childhood (Scooby Doo, Nancy Drew, Sherlock Holmes), hunting for the perfect book in this genre can be daunting. Until now. Author Anita Rodgers has found just the right balance. Well developed characters, a mystery true to what the genre means, plot points in all the right spots, no saggy middle, humor that had me laughing out loud-- which is very hard to do, good entertainment from beginning to end, a true who-dun-it that kept me guessing. I definitely recommend this for your next read. So, about the story: Scotti Fitzgerald has not had an easy life. Abandoned soon after her birth, she grew-up in the California foster care system. She had one friend, Zelda Carter, who was also a foster kid. The experience made her a cynical and suspicious adult, but it also taught her self-reliance. Now Scotti and Zelda are working as waitresses in a diner owned by "Manny the Cuban". Scotti's claim to fame in local circles is her culinary skill, especially when it comes to deserts, which she provides for Manny's diner. Tired of living in California, and anxious to get home to his native Miami, Manny has agreed to sell his diner to Scotti. Her benefactor is George Manston, an affluent personal injury lawyer that admires her tenacity, as well as her brownies, and he has agreed to help her finance the purchase of the diner. But when George dies unexpectantly, Scotti and Zelda are thrust into a complicated web of deceit and murder. As the mystery unfolds, we discover there are many suspects, including Scotti, who is desperate to clear her name. 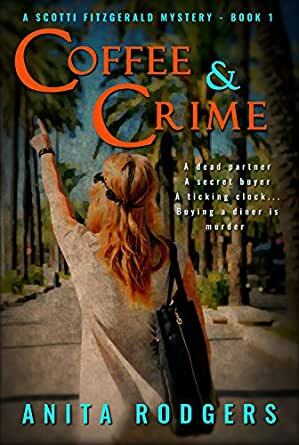 Coffee and Crime is a fun read, and a real page-turner, as we piece the clues together with Scotti and Zelda to ultimately bring the villain to justice. So, about the author: I think Anita Rogers is an excellent writer and story-teller. She presents Coffee and Crime as a first-person narrative, which I find very bold. Too often first-person authors get so lost in didacticism, that the reader is bored to tears. Ms. Rogers isn't one of these authors! She masterfully creates drama and context by weaving Scotti's thoughts and words into the descriptive panorama of the world seen through her eyes. We discover her personality, as well as those around her by the way she experiences their interactions. Sometimes she's right, but sometimes she's wrong, which grounds the story in reality, and lends plausibility to the plot. I'm a sucker for the old pulp fiction crime stories, and Ms. Rogers writing is reminiscent of those, but with a modern twist. Great characters, snappy and very realistic dialogue, a plot that zips along. I felt like Scotti and Zelda were old friends and loved their repartee.This book has humor, mystery, and also sweet romance. I really wanted Scotti and Zelda to find the killer of their friend George who would have made Scotti's dream of owning her own diner come true. Anita Rodgers doesn't disappoint. If you're looking for a great read, buy this book. I look forward to reading the rest of the series. 5.0 out of 5 starsFun and Adventurous! Scotti is a blast of a character to follow. I don't have a lot of time to read, but I started reading and couldn't put it down! You loved the good guys and hated the bad guys and that means that Rodgers knows how to create some serious empathy with her characters! The play off conversations between Zelda and Scotti are the bomb, and sometimes sooooooo funny! Even they way they drive makes me giggle. And, of course, there was THE FOOD!!! I got hungry about every other chapter. At one point, I had to get up and make myself a cupcake and a cappucino!